I like to add a touch of color to the edges of my digital scrapbook pages. Often I will simply use another paper to frame my page, but for this page featuring my nephew and his bride on their wedding day, I wanted a border with a soft, romantic feel. I created it using a corner brush from Melissa Renfro’s Brush Set: Misty. In order to use the brush for all four corners, you will need to rotate the brush. In this tutorial, I will show you the basics for rotating brushes in Photoshop. First, add a new blank layer above your background. When you brush on a new layer, your work is editable. I like to change the name of the layer to show the brush set I am using. Simply double-click on the layer name to edit it. With your new blank layer active, select the brush and your foreground color. If you are using a corner brush like I did, you will need to rotate the brush for each corner. Check the following settings if you have trouble finding the Brush Panel or if yours doesn’t match the screen shot below. Open the Brush Panel. You can use the shortcut F5 or you can open it by checking “Brush” under the Window tab in the top bar. The Brush Tool needs to be selected in order to access the settings in the Brush Panel. 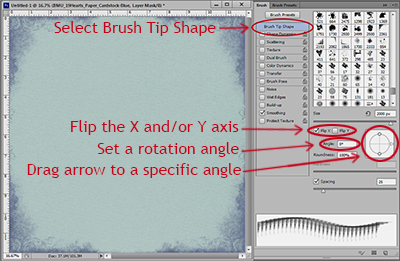 “Brush Tip Shape” needs to highlighted in order to rotate the brush. Set a specific rotation angle. Drag the arrow to a specific angle on the circle. After I added the brushed corners, I created another layer and used the Cloud Brush from the same set to add a little more color to the edges until I got a soft edge that goes well with the photo of my nephew and his lovely bride. The next time try rotating brushes on your layout for a fun new look. 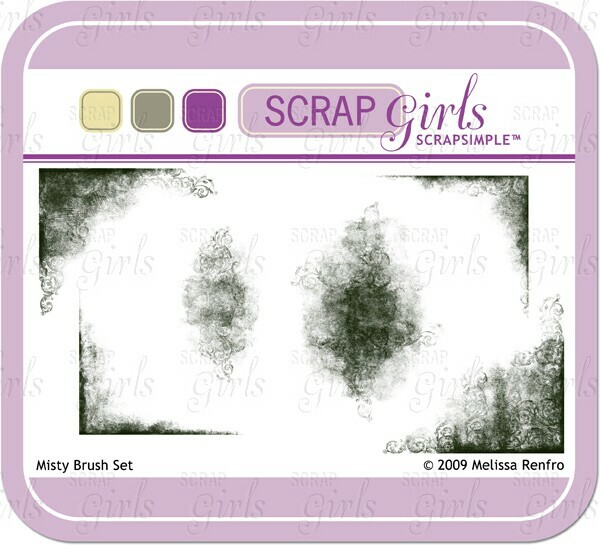 We’d love to see your work, so post your pages in the Scrap Girls Gallery.